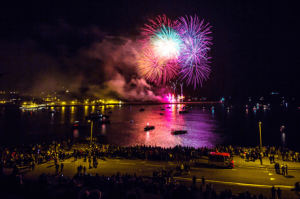 Guy Fawkes’ night is an enjoyable evening for children and adults alike. Following some simple bonfire night safety tips will make sure it’s a night to remember for the right reasons. If you’re attending an organised fireworks display then safety will be the highest priority for the event organiser, but it’s a good idea to have some tips in mind for your own personal safety. If you’re wondering whether to attend a professional display or do your own, check out our guide to DIY and professional fireworks. If you’re planning your own display at home, bonfire night safety should be your number one concern. Only ever buy fireworks from a reputable seller and check that they are marked BS7114 which is the British Standard all fireworks must adhere to. Read the instructions carefully and store them in a closed metal box away from other flammable items. One person should be in charge of lighting the fireworks, which should be done at arm’s length using a taper. Fireworks must be aimed away from people and anything that could be damaged or pose a safety risk. Keep buckets of water nearby in case of emergency. When building a bonfire in your garden, be sure to find a safe spot, away from plants/trees, buildings and people. Don’t stack it too high and keep it stable, falling debris could cause serious injury and spread the fire further than you intended. Only use dry materials, anything damp will cause excess smoke which can be a nuisance to neighbours and unkind to lungs. Never use accelerants to start the fire as these can quickly cause it to burn out of control. Other items you should keep well away from an open fire include aerosol sprays, foam, petrol, paint cans and fireworks. Hopefully an unnecessary precaution, but an important one. Read up on how to treat burns should the need arise and make sure your first aid kit is well stocked. If anyone is injured from a firework or a fire, seek medical advice immediately. Pets and fireworks don’t mix. The loud noises and bright lights can be terrifying for cats, dogs and other animals. If you have pets, make sure they are safely locked indoors, ideally as far from the noise as possible. If you’re lighting a bonfire, carefully check the area for both pets and wildlife (such as hedgehogs) before lighting the fire. Now that we’ve gone through our bonfire night safety tips, go and enjoy some toffee apples, hot chocolate and all the magical delights of a traditional bonfire night, but remember, safety always comes first!